Girls of Australia, this one is for you! Who ever you are, where ever you are from, it doesn’t matter if you are a chilled out fashionista or a sport loving sister. This series is for you. The Rainbow Necklace is a small snippet in the lives of Matilda, Emily, Amy, Belle and Jasmine who are brought together in the dry, dusty outback. Each girl is a typical young Aussie girl, each has a different personality, background and interests. Yet together their differences is what makes them such a great team. Unknown to them their foray in the dust is about to change their lives and open up doors to adventure. Poking around in a shed filled to the rafters with old bit’s and pieces the girls stumble across a necklace with beautiful rainbow beads. Amid the excitement the necklace comes apart sending rainbow rays of light and magic through the dusty air. Before they know it they are no longer in the dusty shed but somewhere else entirely. It doesn’t take them long to realise they have travelled back into history. But there is no time to worry about how to get back. They find a girl called Charlotte who is injured and needs their help. Step back in time with the friends as they feel their way through a time without mobile phones and computers, GPS and ugg boots! I am overjoyed to have found this series! The rainbow necklace is the first edition. Not only does it embrace diversity and culture, friendship and family. It also takes the important and wonderfully fascinating look at Australian history. The world was a very different place for our grandparents there is so much we can learn from that time. Many a modern child would find it hard to believe the everyday living differences of generations past. This is a great series to get your girls reading, positive role models, easy, fast-moving story and resources to further interest and education. Teachers notes will be available soon but even more exciting is the Australian Girl website! This is where you will find a whole bunch of great things. The Australian Girl dolls!! Australian Girl game, activities and competitions. It is super exciting. I am so in love with this brand. They are not your average stick thin bubble headed poorly clothed girls doll. They are something I would be proud to hear my daughter say “I want to be like an Australian Girl.” Unlike much doll merchandise floating around in our girls world. Well done Jacqueline Larsen, and thank you for giving us parents something wonderfully wholesome and Australian to recommend to our children. 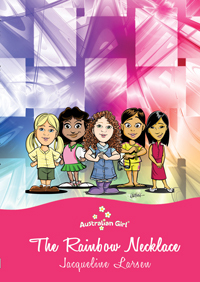 The Australian Girl series is illustrated by Jason Chatfield, of Ginger Meggs. So you can imagine its delightful comic quality. Bug in a Book recommends The Rainbow Necklace and I look forward to the next in the series!